Modifications: I used ground turkey instead of beef, and added a chopped bell pepper. Time to table: 30 minutes prep, 6-8 hours cooking time. Servings: A lot – this nearly filled our crockpot – at least 8 adults. 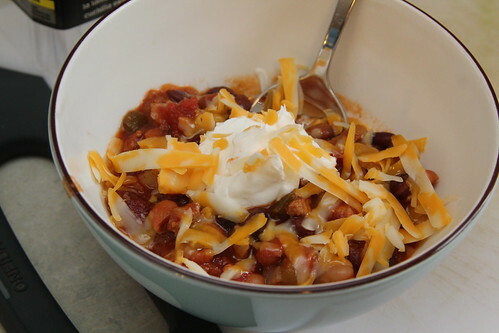 Notes: This chili was really good! We all are bean lovers, so this went over well. 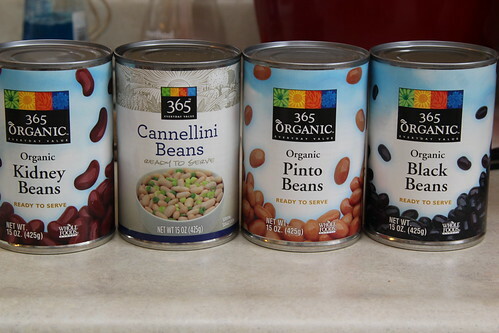 Annie enjoyed narrating which bean she was eating at that time 🙂 This is part of a 3 in 1 meal that weelicious posted, so the next post will be what we did with the leftovers. 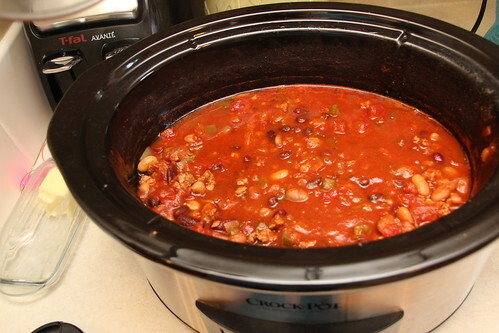 This entry was posted in black beans, crockpot, green pepper, kidney beans, one dish meal, onion, pinto beans, tomatoes, triple love, turkey, white beans. Bookmark the permalink. Making this right now. So simple.